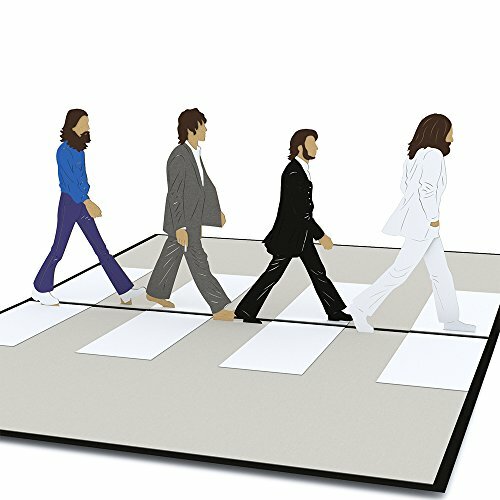 The black cover of The Beatles Abbey Road pop-up card features a laser-cut illustration of the band's iconic logo. Once opened the Beatles themselves emerge. George Harrison, Paul McCartney, Ringo Starr and John Lennon walking outside of their studio in single formation on Abbey Road. Instantly recognizable, each pop-up member of the Beatles has authentic design elements and details as unique as their personal style. This design was created in partnership with The Beatles and is one of two officially licensed designs. This pop-up celebrates the eleventh Beatles album of the same name. Kathie did a fantastic job recreating the iconic image of the Beatles walking across a street outside the famous Abbey Road Studios. Bring a smile to your favorite Beatles fan with this one of a kind design. The Beatles are the biggest band in the world, and we all know someone who can't get enough of them. Make it the best birthday ever by giving The Beatles Abbey Road card to them on their special day. The card is blank, so you don't need an occasion to brighten someone's day with this unique card. Give it to anyone, anytime, just because The Beatles are the best band ever. This Beatles pop up card is 5 inches wide by 7 inches tall and includes one embossed Lovepop envelope. Lovepop 3D, Pop Up, The Beatles Abbey Road Card. Officially licensed by The Beatles. This Beatles pop up card is 5 inches wide by 7 inches tall and includes one embossed Lovepop envelope. To ensure you receive an authentic Lovepop please order from Lovepop, Inc. If you have any questions about this product by Lovepop, contact us by completing and submitting the form below. If you are looking for a specif part number, please include it with your message.